Taming oily skin throughout the day is no easy feat. Reapplied powders can end up looking really cakey, and I don’t know about you, but I need about three oil blotting papers to soak up the oil on my skin (and it’s not even that oily!). But now there’s a new way to stay shine-free on the go, and it works better than any powder or paper I've tried. Benefit’s new The Porefessional License to Blot stick has the oil-absorbing capacity of a full pack of blotting papers, and the portability and usage of a powder compact (without the powder). Let me explain. License to Blot is a balm made with tiny, invisible blotting spheres that mattify skin on contact. The stick is slightly larger than a lip balm and has a triangle shape that allows you to get into every shiny zone on your face, including the sides of your nose, forehead and chin. All you have to do is swipe it on in short, swift strokes and it magically leaves you with a matte finish without depositing any sort of residue on your skin. It won’t even mess with your foundation. And since you’re simply twisting up the product like you would your Chapstick, you’re bound to get many, many more uses out of a single tube than you would with a thin pack of blotting papers. This is going to be a staple in your handbag when the weather starts warming up. 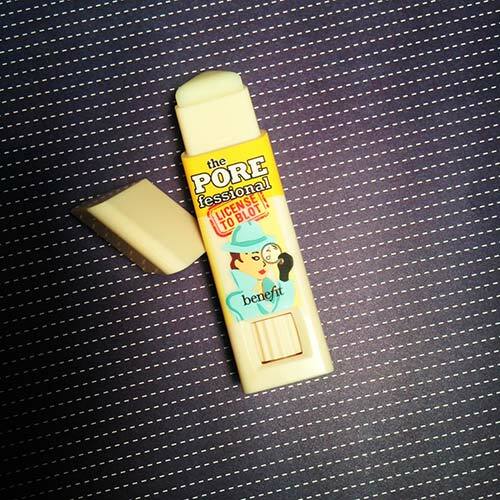 Benefit The Porefessional License to Blot Instant Oil-Blotting Stick ($20) is now available at Ulta.